After enjoying the phenomenal success over the last few years, GMRIT has set its aim high for this year. With meticulous planning and invincible spirit, we are ready to take the challenge further. All the theories boil down to one most crucial thing in Engineering Application. This ideology forms the basis of an occasion which lets the engineer in every student fly and air the spark within. 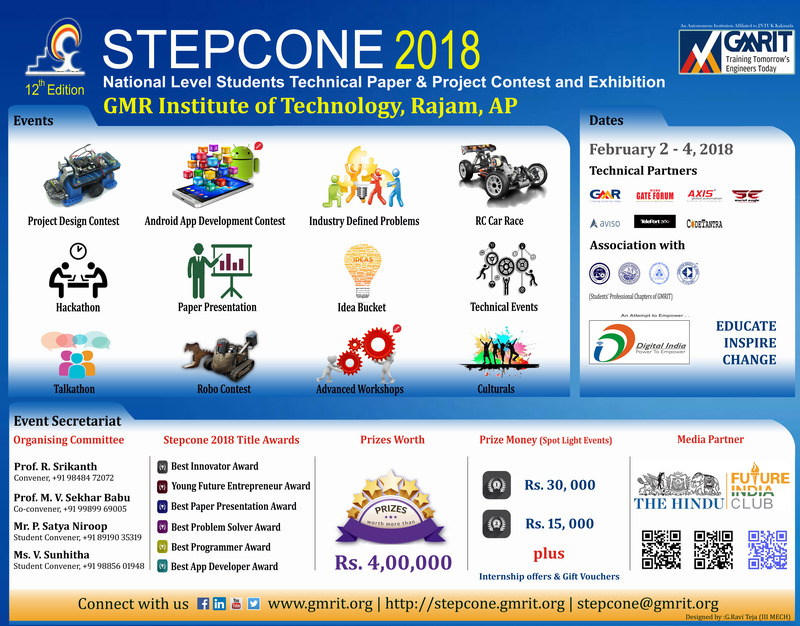 GMRIT takes a great privilege to disclose the 12th edition, the 3-day mega event under the name of Stepcone-2018. Stepcone makes a platform for engineering students where everyone gets a chance to embrace the best of knowledge, envisioning dreams without boundaries, to showcase their skills and knowledge in fun, practical and innovative ways. It seeks to host discourse on concepts, experiences, challenges and their solutions to spread knowledge and faster innovation, inquisitiveness and creativity among young engineering popultion. Pushing our limits further, exploring the hidden potentials, we are conceiving ourselves through bigger, crazier and advanced version of the most awaited technical and cultural colloquium bagging marvelously planned events, enticing guest lectures, advanced workshops, creative non-technical events, exciting spot-events and infotaining spotlights.